1973). May well be used for a tuned frame aerial, but not for a broadband type active aerial. gate circuit should be used with care, or avoided if possible. are too small. 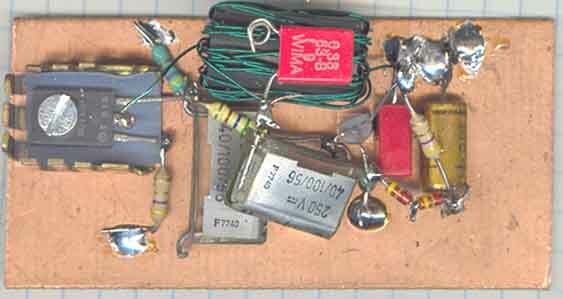 Spurious killer resistors in anode and grid seem important to remember. It seems to be some interest for this construction, and it is copied to another site. seems to be some other parts, too. max output level has 10-15dB lower limit. level is 40mW (+16dBm or 2V RMS in 50W). The limiting factor is collector voltage swing which is then 5.6Vpp. capcitances are necessary. 0.1µF was chosen simply because it was free, it is almost too small for 136kHz. and as such you loose gain. The amplifier is mounted on 35x75mm pcb laminate. Cooling fin is needed and it gets quite hot. a better type for those who like to pay.